The term "nightgown"/"night gown", as used in the 18th century, is somewhat confusing. J. P. Ryan defines an English nightgown as synonymous to robe à l'anglaise, a fitted gown. The Dictionary of Fashion History defines it as "an unboned, loose dress worn for comfort and usually informally." These definitions are polar opposites! From the Trial of Ford Lord Grey of Werk, et al. 1682, published 1712. 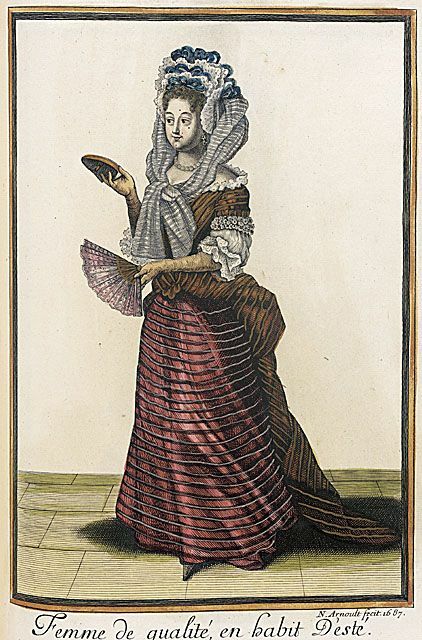 But then the question was - is every mantua/fitted gown/robe à l'anglaise a nightgown, or are there more criteria? Sometimes (well, for the most part) it seems like "nightgown" = "gown" in opposition to sacks/sacques/robes à la française. This led me to some other situations in which the terminology became interestingly muddled. For example, Barbara Johnson's album of fabrics contains notes on what the fabric was used for, and she refers to long and short sacks, gowns, night gowns, and negligees. Fabric widths varied then as now, but it seems in the 1750s and 1760s that a nightgown took the least amount of fabric (without petticoat: 7 yards of ell-wide silk, 8 or 9 yards of three-quarter width silk, or 12-14.5 yards of half-ell silk), while both short* and long sacks took more (14 yards, unknown width - the notes for sacks do not usually include length or width), as did negligees (with petticoat: 16 yards of ell-wide silk, 18 yards of three-quarter width silk, or 22-25 yards of half-ell silk; based on extant garments, about 6 yards of a half-ell wide fabric would do for a petticoat, meaning that the negligee itself took about 17 yards). 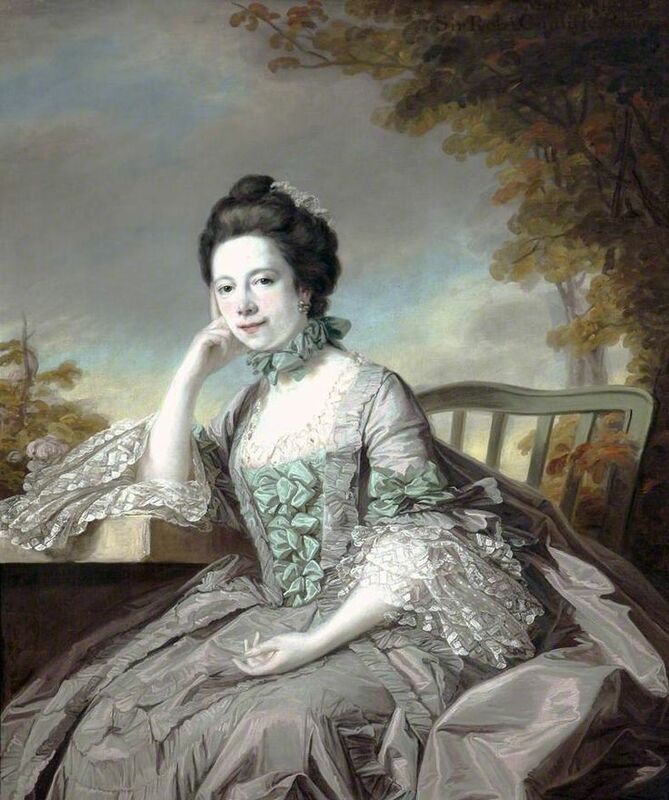 A list of accounts from 1765 listed a dressmaker as making "a blue satin negligee and [petti]coat" for 7 shillings/sixpence, a "black stuff gown and stomacher" for 2/-, "a blue and white striped nightgown and stomacher" for 3/-, and "a bombazeen full trimmed sack and coat" for 16/-. A later list from a milliner shows the making of a white lustring sack with "pinkt" trim and of a pink sack trimmed with silver, each costing 15/-, while she charged 3/- for the making of a green lustring nightgown. Another lists a nightgown at 2/6 and a sack and petticoat at 14/-; another a negligee and flounced petticoat at 8/-, and a stuff gown and stomacher, cotton sack, and linen sack all at 3/-, and a checked sack at 2/-. So in these accounts, a nightgown runs from two to three shillings, sacks from two or three shillings to fourteen or sixteen shillings, and negligees with petticoats seven to eight shillings. This all brings up a couple of different questions to me. What is a negligee, then? There are some references in which a negligee is worn after rising, where it's clearly something to throw on. Then others where it's considered "undress". * But then there are others where women are traveling in a negligee, getting married in a negligee, looking at a half-negligee, describing a trained negligee, walking outside in a negligee, sitting out a ball in a negligee. They were usually made of very fine fabrics. From the comparison of yardage (ellage?) for various types of gowns above, it seems most likely that a negligee is a sack. It takes far too much fabric to be a type of nightgown, even allowing for a self-fabric trim. It also seems most likely from the references in Barbara Johnson's album and in the accounts that negligees are generally made with matching petticoats - flounced, much of the time, if not most. Perhaps the dressmaker in the above quote could not make a negligee in one day because they had a great deal of self-fabric trim. A nightgown was not full dress, no matter what it was made of. At this time, the customer would purchase her own fabric from a draper or mercer and take the cloth to the mantua maker or milliner to be made up into clothing. The material's cost should not be relevant to the price of the labor. The first possibility that opens up is that sacks were much more difficult to make than nightgowns. The first historical sewing I ever did on my own was a française out of Janet Arnold, as a senior in college. It was much easier than the subsequent fitted gowns I made with more experience and skills, but then, it may have been terrible. Still, I don't think this interpretation works. A sack gown requires much less fitting than a nightgown - the silk can be cut to a very rough geometric shape and be pleated into place. The second possibility is a vicious cycle. If rich women buy sacks, they can afford to be charged more. If sacks cost more, then they are a status symbol even beyond the obvious (that they take more fabric, and that they're impractical for housework). They would be an advertisement that the wearer had the money to buy a high-status gown, bearing in mind that at this point the nightgown was not high fashion, even if it were made in lustring or muslin. This is similar to what I found while researching the polonaise some time ago - "poloneses" could cost 12/-, close to the price of a sack, despite requiring less fitting and fewer seams than a gown. The price reflects social value rather than a strict hourly rate. This has an implication for the negligee. If the negligee is a robe à la française, and the sack is also a robe à la française, why does the sack nearly always cost more than the negligee? My interpretation is that "sack" is a basic description of the form of the garment (pleated back), but the negligee specifically is relatively informal. And most of the time a sack was understood as the formal version, so that writers could refer to "sacks and negligees". Lady Cunliffe is probably wearing a negligee and matching petticoat. It's obviously an expensive outfit, made of silk, heavily decorated with self-fabric trim - but it's not the most formal (hence "undress"), with no lace nor metallic braid, equivalent to a man's everyday suit in one or two colors. Appropriate for a wedding in a time when women did not usually have a specific wedding dress, but also appropriate for a quiet morning. This brings the earlier reference of a negligee at a ball into context - the negligee-wearing former "toad-eater", who was dismissed from employment because she imitated her mistress too well, is noted as cooling her heels at a racetrack ball where the rest of the company was as "well-dressed ... as the most brilliant company in London": this is supposed to be a woman who's dressed beyond her station, but not as well as she should be in order to fit with this grand company. You forgot about the cheap sacks, didn't you? I didn't! I just had to ignore them for a bit. The cheap sacks were only in one account: they were a flowered cotton sack, a flowered linen sack, and a checked sack, for 3/-, 3/-, and 2/-, the same amounts that it cost to make a nightgown. I've been under the impression for some time now that the concept of "morning dress" was a nineteenth century invention, but I no longer believe that to be the case. It seems fairly clear that for men, morning dress consisted of a wrapping gown, soft cap, and slippers, but women's was not usually described except as "loose". A sack with lacing or ties in the back could be worn just after rising, without stays, as well as later in the day, but perhaps a less affluent woman would want a untrimmed version in a cheaper fabric - and perhaps only a less affluent woman would want this, making a higher price point for such a sack impractical. Barbara Johnson owned only one (flowered) linen sack, but numerous silk ones, as well as her wool ones for mourning. In Barbara Johnson's album, there are a number of samples from negligees and sacks: six sacks (plus four short sacks) and fourteen negligees. The long and short sacks range from flowered linen and chintz to plain wool or silk to damasks and brocades; there are three brocaded negligees, one dotted lustring, one taffeta with a fly fringe, and nine are plain-woven and unfringed. Again, there is no clear conclusion, but if Barbara Johnson is a representative woman of her time it seems likely that negligees were usually made from plain-woven silk, whether solid-colored or striped. Taken all together, this adds some more nuance to the picture of fashion (English fashion, at least) during the eighteenth century. It introduces a new level in the scale of dress formality, a high-end casual fashion highly linked to domestic settings but also appropriate for public situations. And it makes a few more references in novels and newspapers clear! I sometimes imagine the ladies of the past laughing at us moderns a little as we muddle to understand and categorize their clothing and terminology--not only because we don't "get it" but because I imagine them thinking "who cares what we call it, it's pretty!" or the like. But we do care--and getting into the nuts and bolts can help reveal more about how they wore and understood their clothing within the larger cultural sphere. Here, I think you're spot-on in seeing "high end casual" in these clothes. It reminds me, a bit, of the concept of "boudoir"--the place between public and private. Perhaps these gowns are in some ways a part of the place between as well--not quite casual, but not quite formal presentation, either. I like my phrase "high end casual" too (ha! ), but at the same time I always hesitate when I use "casual" in talking about historical dress, because it has such a strong meaning of comfort and looseness and stretch today, don't you think? Where there were women who might only wear silk gowns/jackets, and would define casual clothes in a very different way. Bah, it's very hard to adapt the modern tongue to historical mindsets. I don't really want to get into a in depth discussion on here about some of your points you've made here (some of which are interesting and gain further thought). I just really feel the need to point out one major factor in pricing that you did not mention (not that you didn't think of it, at least in an abstract sense, but I can't find it specifically referenced.). The reason sacks, polonaises, or any other gown is priced higher, is not necessarily related to its fashionability, but the amount of trim that goes on that sucker (though the more trim = the more fashion...hopefully...unless she has terrible taste). Trim takes forever. FOR-EVER. Seriously. Any base gown can take us between 9-12 hours to make, but the trim is what turns the gown into a 10 hour project to 20, 80, 120. When you compare the books you've used against newspaper adverts it makes it more clear. A lot of mantua makers will have the garment and their cost set, and will usually clarify the amount of trim in the cost (untrimmed, trimmed, full trim) and the prices go up in their advertisements. You're right, I didn't really address the trim possibility in the gown vs. sack/negligee price comparison - I only brought it up in looking at negligees vs. sacks. That could be the big price difference between those non-silk sacks and the nice ones. I had dismissed it because the nightgowns could potentially be trimmed (although those of this period don't tend to be trimmed as frequently as extant sacks) and because of the polonese reference - because polonaises appear to have been trimmed to such a lesser degree compared to sacks. And there seems to me to be too little variation between the prices of gowns and of sacks in my limited pricing sample, when extants and portraits show varying amounts of trim, for me to go with trimming being the reason ... but it's a very small sample. (I have no access to any of the subscription-only newspaper archives online, and the NYPL has totally changed their website, not that I ever understood the search function in their newspaper database anyway.) I'd love to revisit this in the future when I have more prices and descriptions to compare! I hate leaving posts with "well, I speculate that this is why, but I can't really say ..." which is sadly the lot of the researcher dependent on public access databases.